Signed upper left (monogram) and dated upper right: ‘1870’. On reverse inscr. in pencil: ‘Dante Gabriel Rossetti / by Himself / 9’. (a) label inscr. in ink: ‘The original portrait of / Dante Gabriel Rossetti / Drawn by himself. / Exhibited at the “Rossetti” / Gallery 1a Old Bond St, 1883 / catalogue number 15 / A Smit[h]’ and ‘Removed from back June 1939 / 3033’. [i] label inscr. in ink by M.H. Spielmann: ‘Bought by me from Attenborough / in the Strand, with whom it had / [be]en pawned by A. Howell. / M.H.S. 188 [sic]’. [iii] label inscr. : ‘V.E.E / 300 / EARLS’ COURT’. [ii] label inscr. in ink: ‘Per: Mr. H. Spielmann / 21 Cadogan Gardens S.W / Note The hanging wire not to be removed. / J.S.’. [iii] printed label: ‘ROYAL COMMISSION / FOR THE / ROME EXBN. / CASE No. [damaged]’. (e) Sheet 3: blue paper inscr. in ink ‘off of [sic] Frame Back Dante Rossetti 2660 [sic] 3033’ and annotated in pencil ‘June 1939’, to which is glued a printed proof of the engraving after NPG 3033 inscr. in ink on both sides: on the recto ‘As reproduced (rough pull) in The Magazine / of Art(1889 – p.139) in the third of three articles, by William M. Rossetti, The Portraits of Dante Gabriel Rossetti.” / (It is described at length on p.138. It was / drawn in 1870, when D.G.R. was 42 / years of age.) / (see over) / M.H.Spielmann.’ and on the verso ‘Portrait of Dante Gabriel Rossetti / Entered in the “Tabular List of Rossetti’s / Works of Art” in William Michael / Rossetti’s “Dante Gabriel Rossetti as / Designer and Writer” (1889); – / “No.271. 1870. Pen and ink. Dante / G. Rossetti. First and Present owner: / Mrs Schott”’. Owing to the inclusion of the sitter’s monogram at top left, from its first appearance in the 1880s it was also described as a self-portrait, both by its first recorded owner Marion Harry Spielmann and by the sitter’s brother William Michael Rossetti. It was also listed as such by Virginia Surtees in her catalogue raisonné of Rossetti’s oeuvre (Surtees 1971, no.439) and the catalogue for the Royal Academy exhibition in 1973. Around 1987–8 the medium was reclassified, probably on inspection prior to being loaned to Ramsgate Library, when it was described as an etching, but the attribution remained. The labels removed from the frame give various details of its provenance and history, which are discussed below. Despite this endorsement of the work as a self-portrait, some features, together with William Rossetti’s reservations regarding the likeness, prompt reconsideration of the attribution. The reasons for this are as follows. No contemporary record of its execution exists in Rossetti’s correspondence or other documents. It appears to have been unknown to his brother until its posthumous emergence. Moreover, during the early months of 1870 Rossetti had problems with his eyesight that obliged him to stop painting and drawing. The internal evidence is inconsistent. The image does not seem drawn from life in or around 1870, since the features portrayed are more youthful than those in photographs from the early 1860s; see, for example, that taken by W. & D. Downey in December 1863 (see ‘All known portraits, Photographs, 1863, pose [d]’). By 1870 the hairline had further receded and the cheeks grown plumper. (A curiosity is the short shaded bar extending from the sitter’s left eye out beyond his cheekbone, which is not easy to explain physiologically.) However, the features do generally accord with those in self-portraits executed in 1855 and 1861 (see ‘All known portraits’), and portraiture is often inexact without being inaccurate. The angle or viewpoint is consistent with a self-portrait drawn using a mirror. Compositionally, the framing of the head against a lighter square within a dark background, as if indicating a light through a window in front of the figure, complete with a shadow behind the shoulder, was frequently deployed by Rossetti in this period, for example, in a contemporaneous pastel showing Fanny Cornforth (first presumed owner of NPG 3033) holding a fan and a chalk drawing of La Donna della Finestra, both signed and dated 1870, and most notably in the oil painting of Proserpine (begun 1871). 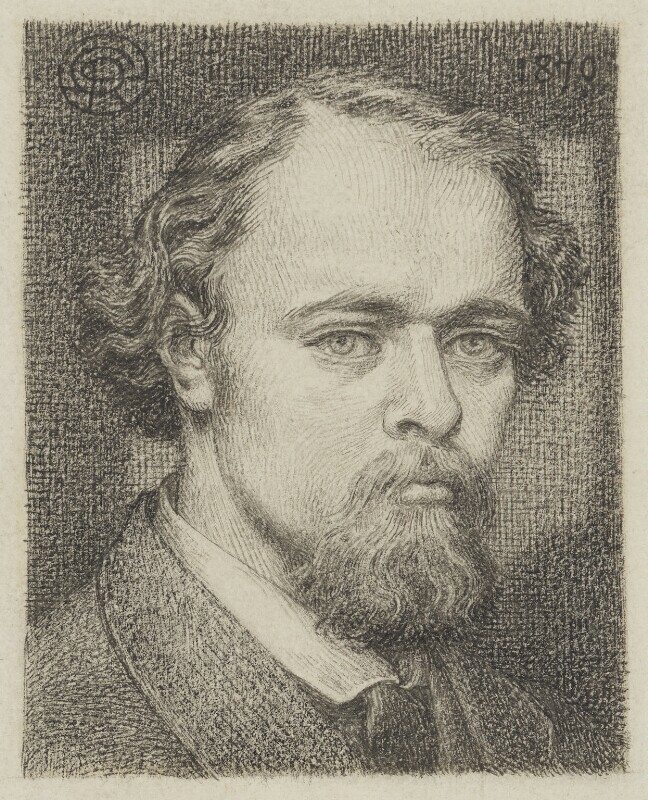 While the medium of thick black ink is not otherwise known to have been used by Rossetti in this period, the dense cross-hatching on a vertical and horizontal grid is seen in two earlier portrait drawings, those of William Holman Hunt from around 1851–3 (Surtees 1971, no.341) and Annie Miller of 1860 (Surtees 1971, no.354). Other aspects of the graphic style, such as the regular curving lines on the face, seem uncharacteristic of his hand. As William Rossetti acutely noted, the expression in the drawing is blander than would be expected, and the presentation is conventional. The very minute and precise drawing is also hard to reconcile with Rossetti’s complaints of poor sight, including double vision, in this period, although that may have interfered more with painting than with close, almost miniature, work like this. Understanding is further complicated by evidence of a second image, showing Rossetti full-face in the mode of the Downey photograph cited above, but with slimmer cheeks. This is known only from a photographic negative (see ‘All known portraits, Possible self-portraits, c.1870’) and almost certainly derives from an untraced drawing based on the earlier photograph. Its lines, hatching and framing are comparable to those in NPG 3033, as are the clothes – collar, tie and jacket – portrayed. Moreover, a photograph of some subject was considered in relation to a proposed de luxe edition of the volume. On 1 June 1870, Rossetti wrote to the publisher F.S. Ellis: ‘About the white-&-gold copies, which are to have the photograph? Has anything been done towards these? I must see immediately about the photo.’  However, no copies of this limited edition, stamped in gold on white buckram boards, includes any illustration and there are no further references to a photo. Such an explanation would also account for the scale of the drawing and precision of the draughtsmanship, even perhaps for the manner in which the lines mimic engraving. It might also help to date the work securely to 1870, when Rossetti and Jane spent some weeks in daily contact in Sussex, immediately prior to the book’s publication. On balance, therefore, NPG 3033 is probably an autograph work, despite the enigmas. Rossetti’s brother and executor W.M. Rossetti would have seen it at the Schott show, but probably only inspected it closely around 1888, prior to its publication in the Magazine of Art (edited by Spielmann) where it appeared with his own article containing the carefully qualified assessment of the likeness quoted above. It was acquired by gift with other items from Spielmann’s collection. 1) Conservator’s condition report, 18 Jan. 2008, NPG RP 3033. 2) In the list of works compiled by W.M. Rossetti in ‘Dante Gabriel Rossetti as Designer and Writer’ (Rossetti 1889b, no.255) it is described as ‘pen and ink’. Despite this and the MA article, of the same year, when lent by Spielmann to the New Gallery in 1892 (396) it was catalogued as ‘small bust. Pencil drawing By Himself’. Marillier’s catalogue raisonné of Rossetti’s work (Marillier 1899, no.302) also gave the medium as ‘pencil’. Surtees 1971, no.439 records it as pen and ink. 3) MA, 1889, p.138. This quotation is included as a typed extract, formerly with or attached to the work, and now in NPG RP 3033 (see ‘Inscriptions’). 4) Surtees 1971, nos 217, 255A and 223A. 5) Emery Walker negs, box no.1045/1, NPG Archive; size of original not known. 8) E.g., for the Moxon edition of Tennyson’s Poems (1857), and illustrations to Christina Rossetti’s poems in 1862 and 1865. 11) Fredeman 2002–10, vol.4, letter 70:171, p.496. 12) Personal communication, Mark Samuels Lasner to Jan Marsh, 28 Aug. 2010. 13) Rossetti had wished to dedicate Poems to Jane Morris but refrained for fear of gossip, as she was married to his friend and business partner. 14) According to W.M. Rosseti’s Diary, 22 May 1883, this was ‘got up by [John] Schott out of the works by Gabriel which remained in the hands of Mrs Schott – some strictly her property, others no doubt not so in reality, but allowed to pass unchallenged as if they were … The catalogue, [Theodore] Watts tells me, is Howell’s doing’; quoted Peattie 1990, p.436. See also NPG 1011. 15) See NPG 1011 for a comparable provenance. Head-and-shoulders, slightly to right, with moustache and goatee beard. Sarah Schott (Fanny Cornforth); M.H. Spielmann, by whom gifted 1939. Rossetti Gallery, London, 1883 (15). Victorian Exhibition, New Gallery, London, 1892 (396). Dante Gabriel Rossetti: Painter and Poet, Royal Academy, London (254). Dante Gabriel Rossetti Drawings and Watercolours, Ramsgate Library, Kent, 1988 (14). Magazine of Art, 1889, p.139. Victorian Exhibition, New Gallery, London, 1892, p.124. Newman & Watkinson 1991, pl.132.